Below you will find many of the terms used in the "Microscope World" - or just simply in microscopy. Abbe Condenser: A specially designed lens that mounts under the stage and is usually movable in the vertical direction. The abbe condenser has an iris type aperture to control the diameter of the light that enters the lens system. By changing the size of the iris and moving the lens toward or away from the stage, the diameter and focal point of the cone of light that goes through the specimen can be controlled. Abbe condensers become more useful at magnifications above 400x. The condenser lens system should have a numerical aperture equal to or greater than the N.A. of the objective lens being used. All of our microscopes that have 1000x magnification use Abbe condensers with a 1.25 N.A. There are two types of condensers - one is a spiral type that you turn to move it up or down and the other is on a rack and pinion system and is controlled with a condenser focusing knob. Achromatic Objective Lenses: When light goes through a prism or lens, it is bent or refracted. Some colors will refract more than others and as a result, those colors focus at different points, reducing resolution. To help correct this problem, achromatic lenses are used. These lenses are made of different types of glass with different indexes of refraction. The result is a better (but not perfect) alignment of some of the colors at the focal point, thereby giving you a clearer image. Analyzer: A microscope analyzer is used with a polarizer to provide polarizing light. On a stereo microscope the analyzer typically connects to the bottom of the stereo microscope body and on a compound microscope the analyzer fits in the head of the microscope. The polarizer is placed over the microscope light source. Articulated Arm: A type of microscope stand that holds a microscope body. The stand clamps to a table or has a large base and has a variety of motion in three dimensions. The microscope body is held onto the articulated arm stand with a focusing holder. Articulated arm microscope stands are often used in industrial and manufacturing settings. Base: The bottom support of the microscope (you may want to also see arm above). Binocular Head: A microscope head with two eyepiece lenses, one for each eye. Generally this term is used in describing a high power (compound) microscope. With a low power microscope the term generally used is "stereo" head because, unlike the compound microscope, the stereo has a separate objective lens for each eyepiece lens, producing two independent paths of light, one for each eye. In a compound microscope with a binocular head, there are two eyepiece lenses but still only one objective lens, so you will not get stereo vision. Body: This term is usually used for a low power (stereo) microscopes and it is the basic heart of the microscope without any type of stand (base) or illuminators. It usually includes the eyepiece and objective lenses but not the focusing block. Calibration: The mathematical process of determining the true distance when using an eyepiece reticle, based on the small lines that are seen on the reticle. View this article on how to calibrate your microscope. C-Mount: This is an adapter used with various types of video or digital cameras. The C-mount adapter drops into the trinocular port of the microscope and has lenses built into it. The C-mount adapter is microscope-specific, meaning that the brand of the microscope and the brand of the C-mount adapter should match - this is because each C-mount adapter is created specifically for a microscope in order to have the correct focal length for the camera. The C-mount adapter has threads on the end of it and connects directly to either a video or microscope digital camera. Coarse Focus: This is the rough focus knob on the microscope. This knob is used to move the objective lenses toward or away from the specimen (see also fine focus). When using a microscope at 400x magnification or above you would want to have both coarse focus and fine focus knobs in order to view a crisp and clearly focused image through your microscope. Coaxial Focus: A focusing system that has both the coarse and fine focusing knobs mounted on the same axis. Usually the coarse knob is larger and on the outside and the fine knob is smaller and on the inside. On some coaxial systems, the fine adjustment is calibrated, allowing differential measurements to be recorded. Condenser Lens: A lens mounted in or below the stage. The purpose of the condenser lens is to focus or condense the light onto the specimen. The higher power objective lenses have very tiny diameters and require concentrated light to work properly. By using a condenser lens you will increase both the illumination and resolution. Condenser lenses are not required on low power (stereo) microscopes. Contrast Plate: A circular opaque plate that is placed on the stage of a low power stereo microscope. One side is white, the other is black. It can be flipped around depending on the coloration of your specimen. Cover Slip: A very thin square piece of glass or plastic that is placed over the specimen on top of a microscope slide. When used with liquid samples, the cover slip flattens out the liquid and assists with single plane focusing. Darkfield: A special microscopy technique that forms a hollow cone of light around the specimen and gives it a backlit affect, so the sample appears bright against a dark brackground. Learn more about darkfield and view illustrations of how it works here. Darkfield can be used on a stereo microscope or on a biological microscope with the proper equipment. Diaphragm: Generally a five hole disc placed under the stage on a high power microscope. Each hole has a different diameter. By turning it, you can vary the amount of light passing through the stage opening. This helps to properly illuminate the specimen and increase contrast and resolution. The diaphragm is most useful at the higher powers. DIN Optics: A German standard for the manufacturing of microscope lenses. DIN lenses aren't particularly better than non-DIN but they will be interchangeable from one DIN standard microscope to another. They are set to work with a 160mm tube length and have a uniform thread. Most quality microscopes use DIN optics. “DIN” is an abbreviation of “Deutsch Institute fur Normung” which is the institute that set the norms or DIN-Norms. Dual Head: A microscope (usually high power) with a single eyepiece lens coming out one side and an additional single eyepiece tube coming either off the top or from the opposite side. Dual heads are useful for a teacher to verify what a student is seeing or can also be used for video or camera work. It is not recommended that two students do a lab sharing a single dual microscope as it can be uncomfortable for the student using the top eyepiece. Dual head teaching microscopes can also have binocular heads. Multi-headed teaching microscopes can have up to five or more teaching heads. Eyepiece Lens: The lens at the top of the microscope that you look into. Standard eyepiece lenses are usually 10x but also are available in 5x, 15x and 20x magnifications. Widefield lenses have a large diameter and show a wide area of the field of view. Eyepiece lenses can be interchanged between different types of microscopes if the eyepiece fits into the eyetube diameter. If possible, it is recommended to use the eyepieces made for the particular microscope. Filters: Microscope filters are placed in the path of light and are used to adjust the color for either observation or photo microscopy. Learn more about the different types of microscope filters and their uses here. Fine Focus: This is the knob used to fine tune the focus on the specimen. It is also used to focus on various parts of the specimen. Generally it is best to use the coarse focus first to get close then move to the fine focus knob for fine tuning. 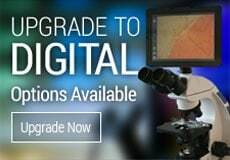 Using a microscope with fine focus is especially helpful anytime you are looking at samples at 400x or above, as it makes it much easier to obtain a crisp and clearly focused microscope image. Field of View: Sometimes abbreviated "FOV", this is the diameter of the circle of light that you see when looking into a microscope. As the power increases, the field of view decreases. You can measure this by placing a clear metric ruler or a stage micrometer on the stage and counting the millimeters from one side to the other. Typically you will see about 4.5mm at 40x, 1.8mm at 100x, 0.45mm at 400x and 0.18mm at 1000x. See also micrometer. Fixed Arm: A type of stand used with low power stereo microscopes. The arm and body are integral parts of the microscope and connected solidly to the base. Fixed arm stands are typically used in schools where it is helpful to have student-proof microscopes that don't have as many removable parts. Notice in the image of the fixed arm stand at left that the focusing holder (part that holds the microscope body) can not be removed from this microscope stand. Focus: A means of moving the specimen closer or further away from the objective lens to render a sharp image. On some microscopes, the stage moves and on others, the tube or head of the microscope moves. Rack and pinion focusing is the most popular and durable type of focusing mechanism. Head: The upper part of the microscope that contains the eyepiece tube and prisms. A monocular head has one eyepiece, a binocular has two (one for each eye), a dual head has two but they are not together, and a trinocular head has three, one which is generally used for a camera connection. Illuminator: A light source mounted under the stage or in a stereo microscope it is often mounted above the stage, or even external from the stand. Four types of light are commonly used: tungsten, fluorescent, LED and halogen. Before LED lights became popular tungsten lights were the most common. Fluorescent and LED are bright, white and run cool. Halogen is very bright and white but gives off heat like tungsten. If viewing live specimens it is important to have a cool light such as LED or fluorescent so the heat from the microscope light bulb won't cook or kill the specimen. Immersion Oil: A special oil used in microscopy with typically the 100x objective lens (usually at 1000x total power). A drop of immersion oil is placed on the cover slip and the objective is lowered until it just touches the drop. Once brought into focus, the oil acts as a bridge between the glass slide and the glass in the lens. This concentrates the light path and increases the resolution of the image. Both Type A and Type B immersion oils are commonly used in light microscopy and the only difference is the viscosity (B is more viscous). Immersion oil is only used with immersion oil objectives. Inclination Joint: Where the microscope arm connects to the microscope base, there may be a pin. If so, you can place one hand on the base and with the other hand grab the arm and rotate it back. It will tilt your microscope back for more comfortable viewing. One drawback of tilting it back is that wet samples will run off the slide. Interpupiliary Adjustment: When using a stereo or binocular microscope there must be an adjustment for the distance between the viewers' eyes. A young child will have a small interpupiliary distance while an adult will have a larger one. The eyepiece lenses will spread apart or get closer together to fit each individual. This should be the first adjustment to make so that you are comfortably viewing the specimen with both eyes. Mechanical Stage: A mechanical way to move the slide around on your microscope stage. The mechanical stage consists of a slide holder and two knobs. Turn one knob and the slide moves toward or away from you. Turn the other knob and the slide moves left and right. Since everything is upside down on a (high power) microscope it takes some getting used to but it is very convenient to have one especially when observing moving specimens like protozoans or other pond water critters. Microscopes either have the bolt on mechanical stage that can be added (to many models) at any time or the integral mechanical stage that comes built in to the microscope. A microscope mechanical stage is very helpful anytime you are viewing specimens at 400x magnification or higher. Micrometer: Also called a micron it is the metric linear measurement used in microscopy. There are 1000 microns in a millimeter. If something is 1.8mm long then it can also be expressed as 1,800 microns (or micrometers) long. Mirror: Allows you to direct ambient light up through the hole in the stage and illuminate the specimen. The very first microscopes used mirrors for lighting rather than built-in illuminators. Today mirror microscopes are not as common. Monocular Head: A microscope head with a single eyepiece lens. Nosepiece: The part of the microscope that holds the objective lenses also called a revolving nosepiece or turret. Numerical Aperture (N.A. ): This is a number that expresses the ability of a lens to resolve fine detail in an object being observed. It is derived by a complex mathematical formula and is related to the angular aperture of the lens and the index of refraction of the medium found between the lens and the specimen. To get the best possible image, you should have a condenser system that matches or exceeds the N.A. of the highest power objective lens on your microscope. (Note: N.A. is only important with high power microscopes). Objective Lens: The lens closest to the object. In a stereo (low power) microscope there are objective pairs, one lens for each eyepiece lens. This gives the 3-D effect. On a stereo microscope the objective lens is built into the body of the microscope and can not be changed. A stereo auxiliary lens can be added to a stereo microscope to alter magnification, but the primary objective lens can not be changed the same way a compound microscope objective can. On a high power binocular microscope there is still only one objective lens so no stereo vision is provided. On a high power microscope magnification is changed by moving from one objective lens to another. Oil Immersion Lens: An objective lens (usually 100x although sometimes 50x or 60x) designed to work with a drop of special microscope immersion oil placed between it and the slide. With immersion oil, an increase in resolution will be noticed. Also, see "Immersion Oil" above. Parcentered: This is an alignment issue. When changing from one objective lens to another, the image of the object should stay centered. Test this by centering something in your field of view. Change to a higher power. Is it still centered? Almost all microscopes are parcentered prior to shipment. Parfocal: This is a focus issue. When changing from one objective to another, the new image should be either in focus or close enough so that you can refocus with only minor adjustments. Most microscopes are parfocal. Often times if a different brand of objective lens is put it on a microscope, the lenses will not be parfocaled. Phase Contrast: Phase contrast microscopy was first described in 1934 by Dutch physicist Frits Zernike and is a contrast-enhancing optical technique that can be utilized to produce high-contrast images of transparent specimens such as living cells, microorganisms, thin tissue slices, lithographic patterns, and sub-cellular particles (such as nuclei and other organelles). Phase contrast uses an optical mechanism to translate small variations in phase into corresponding changes in amplitude, which can be visualized as differences in image contrast. One of the major advantages of phase contrast microscopy is that living cells can be examined in their natural state without being killed, fixed, and stained. Phase contrast objectives can be added or purchased on many high power compound, or laboratory microscopes. Phase is only useful on specimens that do not absorb light (they are called "phase objects") and it is very useful in showing details in certain specimens such as cell parts in protozoans, bacteria, sperm tails and other types of unstained cells. 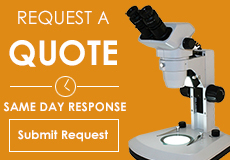 Learn more about phase contrast microscopy here. Pointer: When you look through the eyepiece lens, you may see a pointer. By turning the eyepiece, you can rotate the pointer around. Eyepiece pointers are typically found in high school microscopes and are used for teaching. Polarizer: A microscope polarizer is used in conjunction with a microscope analyzer. The polarizing filter is placed above the light source on or beneath the stage and the analyzer is either placed in the head of the compound microscope or screwed onto the bottom of the body of the stereo microscope. Post Stand: A type of stand used with low power stereo microscopes. The microscope post stand consists of a single post rising vertically from the base. 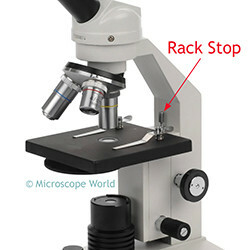 The microscope body can rotate around the post and it can also be moved up and down on it. The post stand is an alternative option to the fixed arm stand (shown above). Rack and Pinion: The rack is a track with teeth and the pinion is a gear that rides on the teeth. By turning a knob, the pinion gear moves along the rack. These systems are used in focusing mechanisms, in Abbe condenser focusing systems, and on mechanical stages to move the slide around. 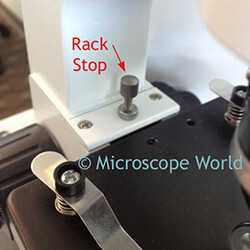 Rack Stop (or Safety Rack Stop): Usually set at the factory, the rack stop keeps you from cranking the objective lenses too far down and damaging either the objective lens or the microscope slide. If you are using a very thin slide, you may find that you can't get the high power objective lens close enough to the slide to focus. Here you can either adjust the rack stop or place a thin glass slide under your original slide, making it closer to the lens. Microscope rack stops are commonly found on high school student microscopes in order to keep students from damaging objective lenses. Resolution: The ability of a lens system to show fine details of the object being observed. Reticle: A very tiny grid pattern printed on a circular piece of glass that is inserted in a microscope eyepiece lens. A microscope reticle is also sometimes referred to as a "reticule" and is used to make actual measurements of the size of objects seen through the microscope. Reticles are available in a variety of patterns including rulers, grids, crossed scales, concentric circles, comparators, grain sizing, and many more. Revolving Nosepiece: A nosepiece that revolves and allows you to use different objective lenses - see also nosepiece. Ring Light: An independent light that usually connects to the stereo microscope body and gives off a ring of light, flooding the working area with bright light. Ring lights are most often LED and are attached to the bottom part of a stereo microscope, right above the stage where the object rests. When using a ring light it is possible you will first need to attach a ring light adapter to your stereo microscope so the ring light has a place to attach the thumb screws. Semi-Plan Objective Lenses: Not all microscope lenses are perfect. A standard Achromat objective lens will have a clear focus in about 60% of the center of the field of view. If you were looking at something perfectly flat, you might find that much of the center part of your field of view is in focus but out on the edges it is fuzzy and a bit out of focus. Semi-plan objective lenses improve this deficiency by showing sharper images and less aberrations in the perimeter of the field of view. Semi-Plan Objective lenses provide about 80% clearly focused in the center of the field of view. They are better than standard achromatic lenses but cost a bit more. A plan achromat objective lens will correct for all aberations and provides a 100% fully clear and flat field of view. Slide: A flat glass or plastic rectangular plate that the specimen is placed on. The microscope slide may have a depression or well to hold a few drops of liquid. Prepared slides are glass slides that have been prepared with a sample, sealed and labeled for future use. Slip Clutch: When students bring the focus all the way up or down and continue to try turning the knob, damage to the focusing system can occur if there is not a slip clutch. The microscope slip clutch is a mechanical device that protects the gears of the microscope. Stage: The flat plate where the slides are placed for observation on a compound microscope or larger samples are placed on a stereo microscope. Stage Clips: Clips on the stage used to hold the microscope slide in place. On student compound microscopes many times the stage clips can be removed and replaced with a mechanical stage. Stage Plate: On a low power microscope, there is a frosted circular glass plate that fits over the lower illuminator. This is called the stage plate. See also contrast plate. Stand: On a low power stereo microscope, the type of connection between the microscope body and the base. There are three main types of microscope stands: the post, the fixed arm and the universal boom stand. Stereo: Related to microscopes, seeing with both eyes through separate eyepiece and objective lenses. With two objectives, the image looks 3-D, we see it in "stereo"! See also Binocular head. Student Proofed: Many microscopes are made with the classroom in mind and have just about everything locked down. You need special tools to remove eyepiece lenses, objective lenses and they have all the safety devices like the rack stop. These microscope are not totally student proofed (like drop proof!) but close. Sub-stage: The area below the stage as in "sub stage illuminator". T-mount: A type of adapter used to mate still cameras (usually 35mm or SLR digital) to microscopes. These are often used with SLR cameras and are used in combination with an SLR adapter for a microscope. Tension Adjustment: This is an adjustment of the focusing mechanism that is made at the factory. It is set so that the instrument is easy to focus but also tight enough so that the stage doesn't drift when you are not focusing. Stage drift is caused by the weight of the stage (or tube) automatically unfocusing the microscope. Trinocular Head: Available on both high and low power microscopes, trinocular heads have two eyepiece lenses (one for each eye) and a third port at the top for a camera. Some microscopes give you the option of sending all the light to the trinocular port, or perhaps half and half, or maybe 80/20%. On some stereo trinocular heads with dual power, the trinocular port transmits the image through the set of lenses not being used by the stereo eyepieces. Universal Stand: A long boom type arm used to support a (low power) stereo microscope body. It has many adjustments allowing the microscope to be aligned in a wide variety of configurations. Generally one uses an external light source (such as a fiber optic ring light or a dual arm pipe light) with a universal stand. Widefield eyepiece lenses: These are wide diameter glass eyepiece lenses. They offer the greatest field of view when looking at specimens. X: Times as in 400x or four hundred times magnification. The magnification of a microscope is determined by multiplying the power of the eyepiece lens by the power of the corresponding objective lens. XR: The X is times (see above) and the R stands for retractable. These objective lenses have a spring loaded tip so if they hit the slide, they will retract, and telescope inward. This prevents damage to the lens or slide.